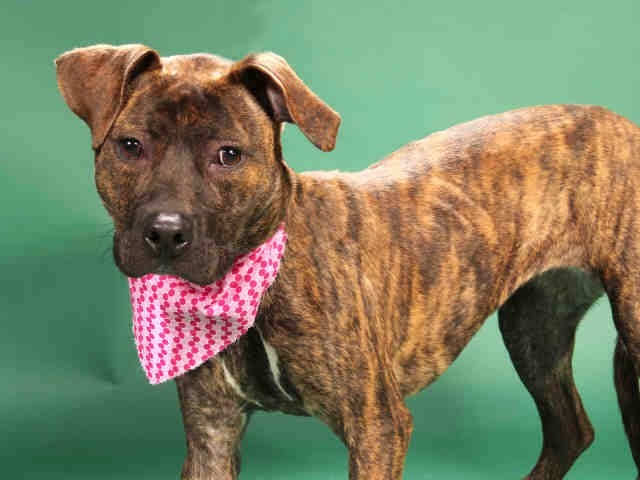 Wonton is a 1 year old brown brindle Pit Bull Terrier mixed breed dog. According to the staff and volunteers at the Humane Society of Missouri St. Louis City animal shelter, Wonton can be a little shy around new people and situations. Consequently, she's love a quiet home, somewhere she can feel safe and secure. She does warm up to folks and then she's oh, so sweet and affectionate. Wonton loves to be petted and will roll over for some nice belly rubs. While Wonton has been at the shelter, she's learned to walk nicely on a leash. She loves going outside. Wonton is alert and attentive. Wonton is two of the HSMO special programs. In their Shelter to Home program, she's learning basic commands. So far she has mastered sit, down and wait. She is also in their Dog to Dog Socialization where she's learning how to play with other dogs. She's doing great with that! 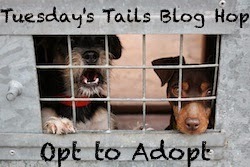 I hope both Wonton and Daisy both find great homes! Glad Wonton has had some good obedience training and seems to play well w/ other dogs; that is so important to potential adopters! Sharing. Brindle dogs are so beautiful, and Wonton is no exception. Sharing her and hoping she finds her new home soon. I love her name - and she looks like such a sweetie. I hope Wonton & Daisy find loving homes soon. It's so great to know they're working on obedience - it should not only help with manners but also improve Wonton's confidence since she's a bit shy. It is great to hear about the extra programs that Wonton is able to participate in. I bet all the extra attention Wonton is receiving will help her find that perfect home soon. She is precious. She has the cutest face! Sharing.